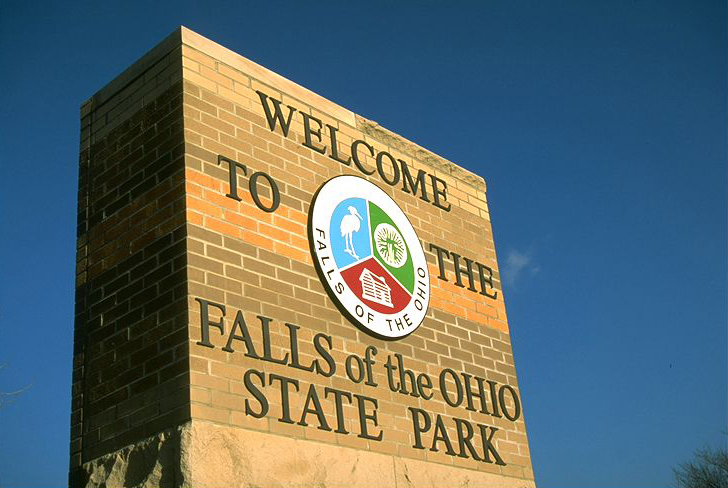 Established in 1990, the Falls of the Ohio State Park encompasses a rich cultural and natural history unlike anywhere else along the Ohio or Mississippi rivers. 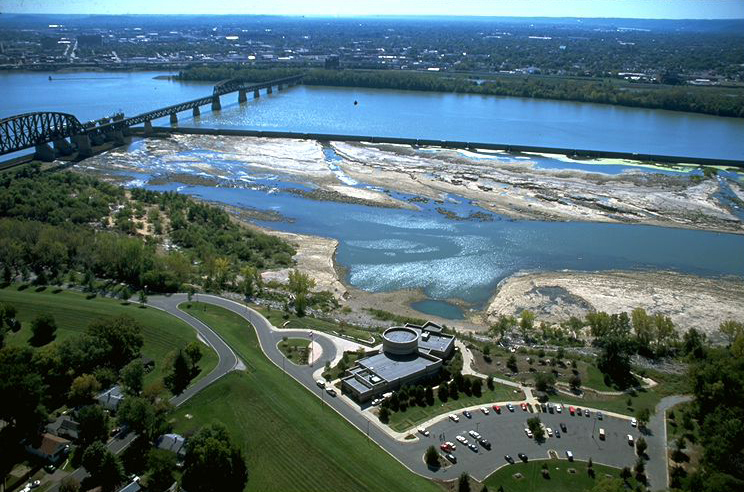 Between the start of the Ohio River near Pittsburgh, PA and the confluence of the Mississippi River and the Gulf of Mexico, the Falls of the Ohio represented the only place where shallow rocky rapids impeded river travel-- until their submersion by dams in the late 1800s. 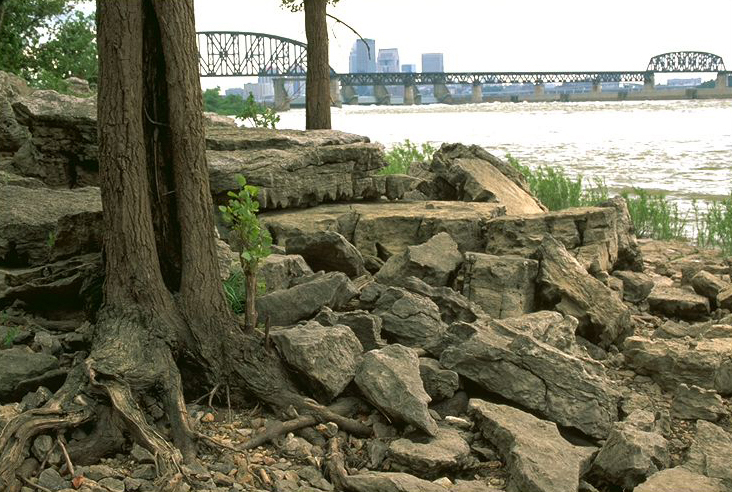 However, what Falls of the Ohio State Park is best known for are its exceptional fossil beds. The naturally exposed 390-million-year old Devonian fossil beds are among the largest in the world. To date, more than 600 species of fossils have been described at the Falls, two-thirds of which have been “type specimens,” which are fossils described for the first time. Included in these fossils are more than 250 species of corals. Culturally, Falls of the Ohio S.P. has a plentiful history as well. Following George Rogers Clark’s successful expedition to capture the British-held Fort Sackville in Vincennes in the winter of 1779, he became a nationally celebrated Revolutionary War hero. In exchange for his service and success, Clark was granted a large tract of land in the area now known as Clark County in southern Indiana. From this land, a portion was set aside for the creation of the town of Clarksville. George Rogers Clark had also established the first permanent English-speaking settlement in the Northwest Territory on Corn Island in 1778. Despite Clark’s military successes, financial victories never materialized, especially after the United States Congress and Virginia declined to cover Clark’s wartime debts. In 1803, Clark, nearly penniless, moved just outside of Clarksville into a two-room log cabin where he lived and operated a grist-mill with two African-American indentured servants until 1809, when a stroke and a severe burn required the amputation of his leg. Clark then moved to Louisville to live with his sister and brother-in-law. However, it was during Clark’s time in this cabin that Clark’s younger brother William met Meriwether Lewis. On October 14, 1803, Captain Lewis met Captain William Clark at the Falls. 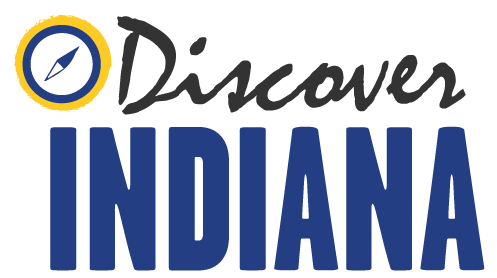 Over the next few weeks, a crew was assembled with men from the surrounding areas in Kentucky and the Indiana Territory, making up the “Corps of Discovery,” which spent two years exploring the Louisiana Purchase. This is also where Lewis and Clark departed for St. Louis ahead of their famed expedition. Today, there is a replica cabin (relocated from Ripley County, Indiana) and a historical marker where the original cabin stood, located within Falls of the Ohio State Park. 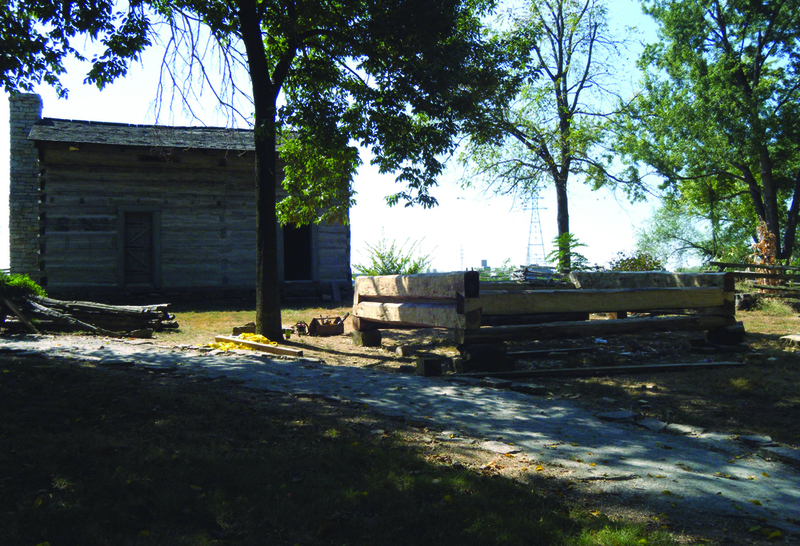 In addition to Clark’s cabin, a second constructed cabin interprets the lives of the McGees, enslaved Africans to George Rogers Clark. The McGees lived in Guinea Bottoms, one of the first free African-American settlements in the Northwest Territory. The site was listed in the National Register of Historic Places in 1974. Indiana Division of Historic Preservation and Archaeology, “Falls of the Ohio State Park,” Discover Indiana, accessed April 25, 2019, https://publichistory.iupui.edu/items/show/367. Published on Mar 2, 2018. Last updated on Apr 2, 2019.